At large receptions and similar events, it's often very difficult for host and guest alike to figure out the proper seating arrangement. To avoid confusion and the potential embarrassment resulting from an impromptu game of musical chairs, Royal International suggests its numbered table sets 151-200 (ROY TN 151 200). These 4-inch square plastic number cards fit in standard menu holders or clips and are large enough to be visible from afar making it a snap to direct guests to their proper tables. 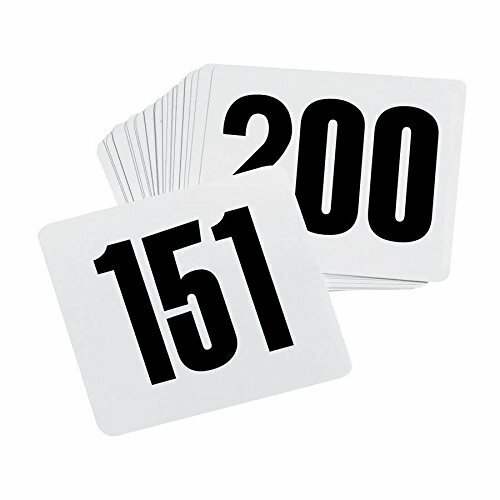 These plastic numbered cards from Royal Industries are for tables numbered from 151 to 200 and comes in a white colored background. With a white background and with numbers in bold, black font, visibility will be great even from long distances. These plastic cards are made from PVC sheet plastic which is ultra soft and will be very durable. This material will also aid in easy cleaning so that the color white will remain bright. INCLUDES CARDS NUMBERED 151 - 200: These are plastic cards for tables numbered from 151 to 200. WHITE BACKGROUND, BOLD BLACK NUMBERING ON BOTH SIDES OF EACH CARD: With a white background, this card has numbers in bold black font for easy readability and the numbers are printed on both sides of the card. PERFECT FOR CATERED EVENTS, RESTAURANTS, BARS AND PIZZERIAS: These plastic cards will be an ideal choice for restaurants, hotels, etc. for serving the tables as the cards with the big, bold look will be visible even form longer distances. MADE OF PVC SHEET PLASTIC: These plastic cards are made of an ultra-smooth PVC sheet plastic which will ensure its longevity and will also be easy for cleaning. PRODUCT SPECIFICATIONS: Base material: PVC sheet plastic, Dimensions: 4" x 4". Numbers Included: 151-200. Gridmann NSF Stainless Steel Kitchen Wall Mount Shelf Commercial Restaurant Bar w/ Backsplash - 12" x 36"